“…His instability I was induced to ascribe to a peculiar mental and corporeal malady, to which he has been subject for some years. 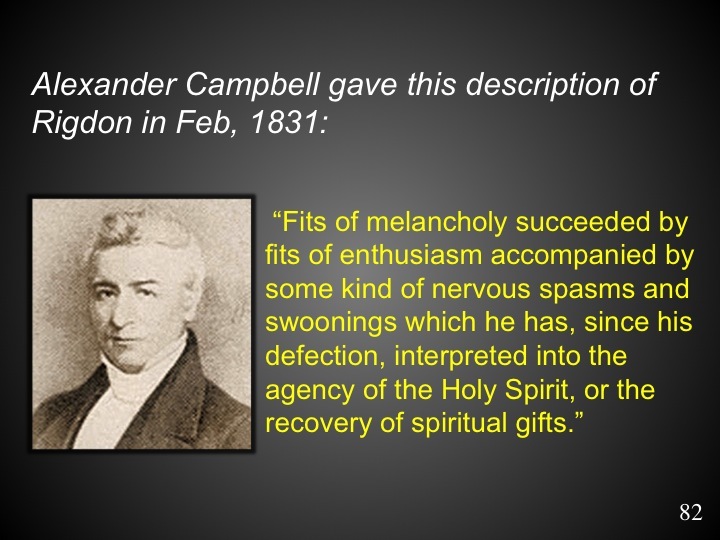 Fits of melancholy succeeded by fits of enthusiasm accompanied by some kind of nervous spasms and swoonings which he has, since his defection, interpreted into the agency of the Holy Spirit, or the recovery of spiritual gifts, produced a versatility in his genius and deportment which has been increasing for some time. I was willing to have ascribed his apostacy to this cause, and to a conceit which he cherished that within a few years, by some marvelous interposition, the long lost tribes of Israel were to be collected, had he not declared that he was hypocritical in his profession of the faith which he has for some time proclaimed. Perhaps this profession of hypocrisy may be attributed to the same cause.